Panama City Beach Weddings are a thing of beauty at Beachside. Do you hear wedding bells? (Or is that the sound of waves crashing along our sunny shores?) 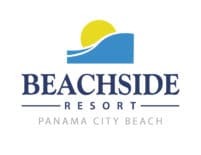 Beachside Resort is the ideal spot for Panama City Beach weddings. Located on the quiet western end of Panama City Beach, FL, our hotel enjoys one of the largest beachfronts in the area – the perfect place for your most important day. We offer a beautiful beachfront venue and newly renovated accommodations, all under the same roof. We can also connect you with the best vendors on the beach – so your flowers and photos, music and menus will all be in good hands. Let us make your Panama City Beach wedding the day you always dreamed of. After you say your vows, our Gulf front sun deck is a lovely location for your wedding reception. Clink your glasses for a sunset toast, then dance the night away under the stars. Even better, your guests don’t have to go very far when they’re ready to call it a night! With our sugar white sands and crystal clear waters as your stunning backdrop, only the bride could be more beautiful. Panama City Beach weddings are just one of the things we do best. Connect with our weddings team now.